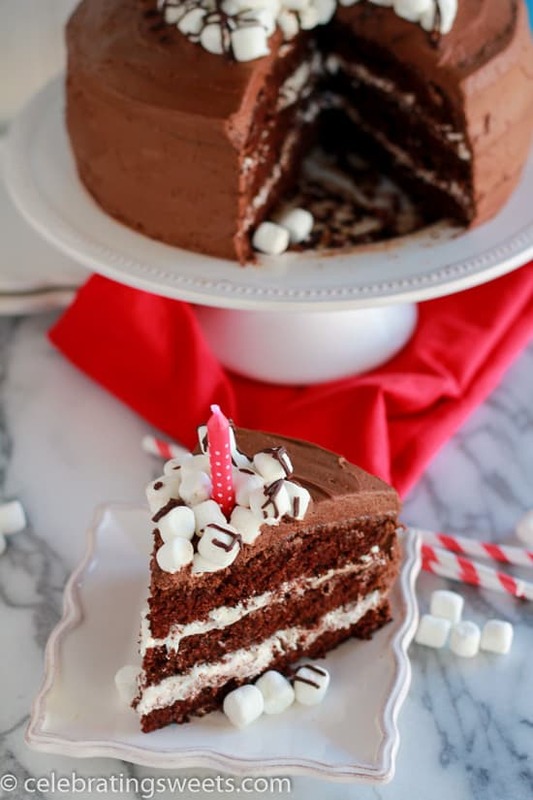 Chocolate Marshmallow Cake – A moist chocolate layer cake filled with marshmallow frosting, topped with chocolate buttercream frosting, and garnished with mini marshmallows. Earlier this week we celebrated Jake’s fourth birthday. 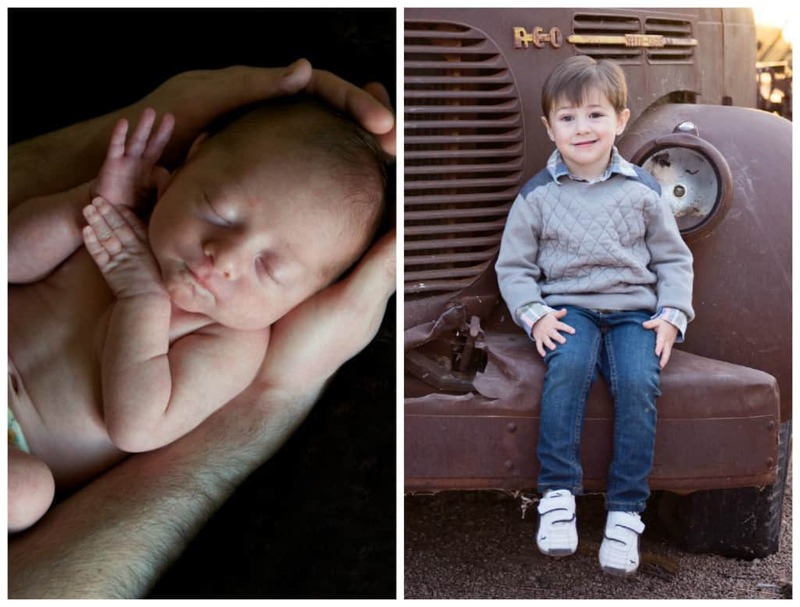 I can’t believe that it’s been four whole years since I brought my tiny, 5-pound baby home from the hospital. Jake’s birthday will always hold an extra special place in my heart because it is the day that I became a mother. My road to motherhood was a long and difficult journey, and I am so blessed that I get the privilege of raising such a kind, rambunctious, smart, and sensitive boy. Not a day goes by that I don’t thank my lucky stars for him (and his sister). My mommy heart simultaneously breaks and expands every time he reaches a milestone. Can someone please (pretty please, right now!) invent a way to freeze time? I want to remember this fun and precious age forever. I could go on for days gushing about my sweet boy, but I’ll pull myself together so that we can talk about cake. More specifically, Jake’s chocolate marshmallow birthday cake. Oh. Yes. Several weeks ago I asked Jake what kind of cake he wanted for his birthday. He requested a cake with chocolate and marshmallows (two of his favorite things). 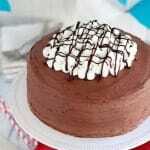 I had never had a chocolate marshmallow cake before, and I was thrilled to create the perfect recipe for him. I decided on a three-layer chocolate cake with a marshmallow cream frosting on the inside and a chocolate buttercream frosting on the outside. I wanted the ideal balance of chocolate and marshmallow, without one dominating the other. 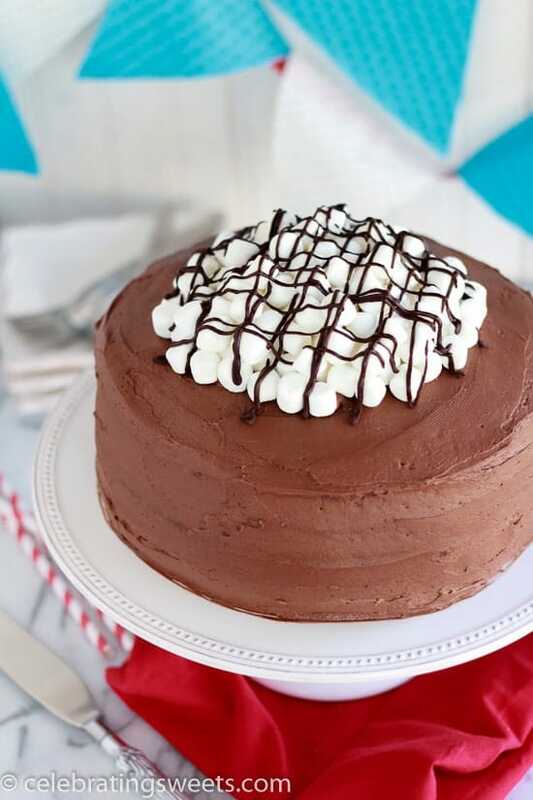 The chocolate cake is moist with a mild chocolate flavor, and it goes wonderfully with the gooey marshmallow frosting, the rich chocolate frosting, and the heap of chewy marshmallows adorning the top. As you can tell from the photos, this is not a fancy, sophisticated layer cake. It’s messy (hello, tumbling marshmallows), it’s fun, and it’s kid friendly. No frills here. Just a festive birthday cake to celebrate our four year old boy. A moist chocolate layer cake filled with marshmallow frosting, topped with chocolate buttercream frosting, and garnished with mini marshmallows. Preheat oven to 350°F. Grease three 9-inch cake pans, and line the bottoms with rounds of parchment paper. Set aside. In a large bowl, stir together the sugar, flour, cocoa powder, baking powder, baking soda, and salt. 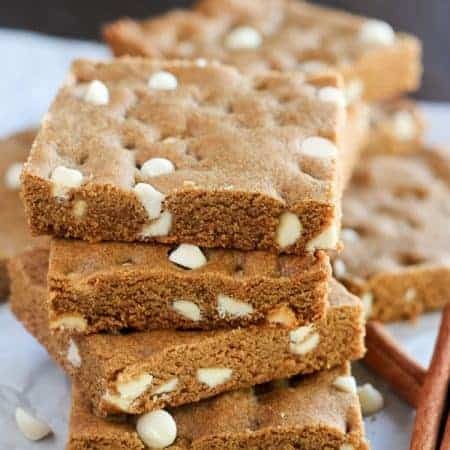 Add eggs, milk, oil, and vanilla extract, and beat on medium speed for two minutes with a hand mixer or stand mixer. Add the boiling water and stir to combine, scraping the sides and bottom of the bowl as necessary (the batter will be thin). Divide the batter evenly among the three prepared pans. Use a measuring cup or large glass measuring bowl to help divide the batter evenly. Bake for 22-25 minutes, until a toothpick inserted into the center of the cakes comes out clean. Place the pans on wire racks to cool completely. You can also refrigerate the cakes (tightly covered) until you're ready to frost them. With a hand mixer or stand mixer, beat the butter and powdered sugar until creamy and combined, about one minute. Add vanilla extract and milk, and beat for another minute. Add the marshmallow creme and beat until completely combined, about one additional minute. 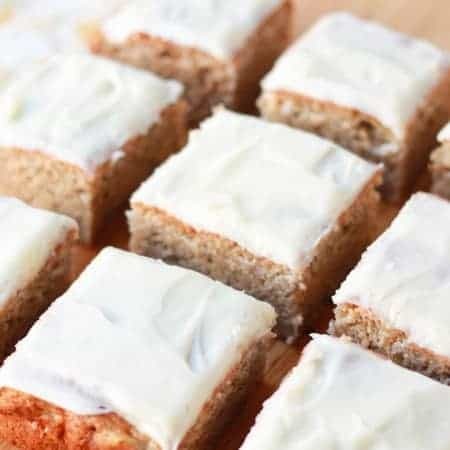 Place one layer of cake on a serving platter and spread with half of the marshmallow frosting, leaving a 1/4 to 1/2 inch border around the outside (so the frosting won't spill out the sides). Place another layer of cake on top, and spread with the remaining marshmallow frosting, leaving a 1/4 to 1/2 inch border around the outside. Place the third layer of cake on top of that, and transfer the cake to the refrigerator while you prepare the chocolate frosting. Whisk or sift powdered sugar and cocoa powder until all lumps are removed. With a hand mixer or stand mixer, beat butter, cocoa powder, and powdered sugar on low speed, then slowly pour in the 1/4 cup milk. Once the ingredients are incorporated, increase the mixer to medium speed and beat for about one minute, until thick and creamy. Add more milk, if needed, to thin out the frosting. 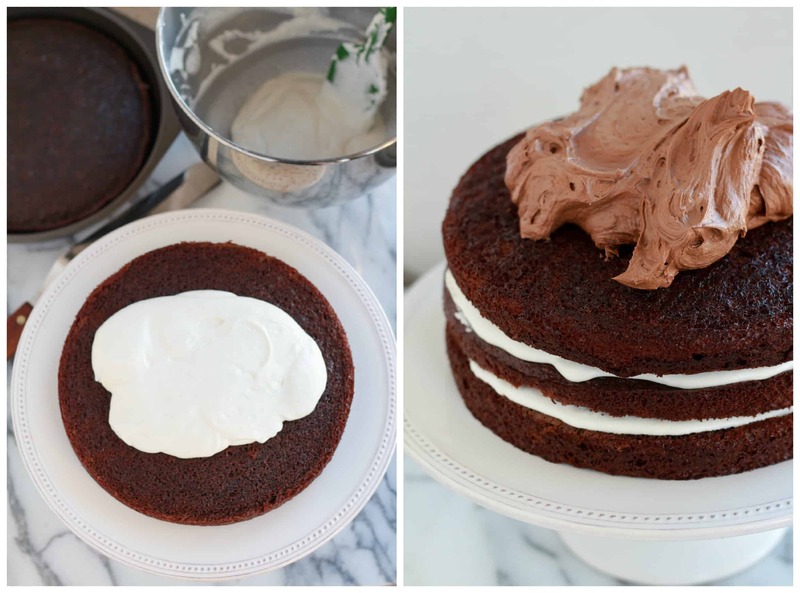 Remove the cake from the refrigerator and frost the top and sides with the chocolate frosting. 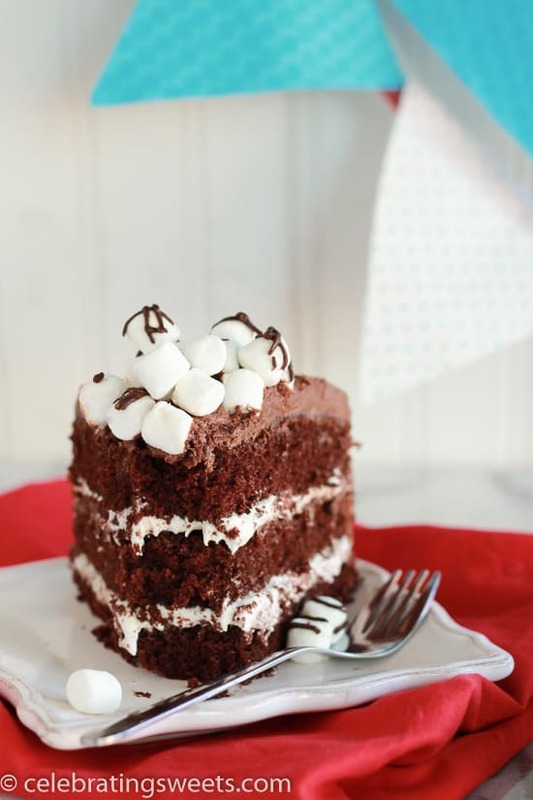 Immediately pile the mini marshmallows in the center of the cake, lightly pressing them down to help them stick to the frosting. 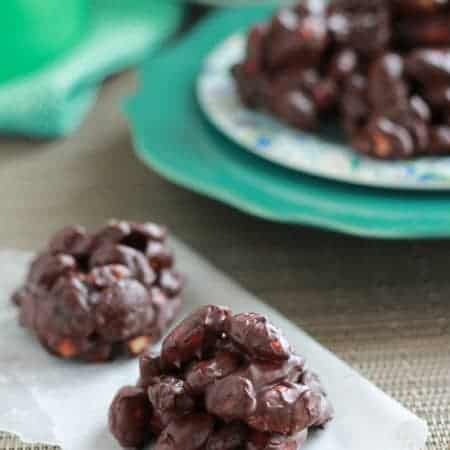 Heat the chocolate chips and 1 teaspoon milk in the microwave in 15-20 second increments, until smooth and creamy, stirring frequently. Drizzle the marshmallows with melted chocolate (this will help them stick together). Place the cake in the refrigerator to allow the frosting to firm up. Allow the cake to sit at room temperature for an hour before serving. You can make the cake a day ahead and keep the layers tightly covered in the refrigerator until you're ready to frost them. That cake recipe is my all time favorite. I use boiling coffee instead of water with 7 minute frosting and everyone goes crazy for it! 🙂 I’m going to try your marshmallow cake! Cheers! Isn’t it the best & easiest cake ever? I used the same recipe for an espresso layer cake (coming soon), and I used hot coffee for that one. So good. Thanks for stopping by! I made this with my daughter yesterday and it was sooooooo delicious!!! Of course, I am one of those annoying bakers who takes every recipe as a “suggestion” so we made a few changes. 😉 I have a big silicone cupcake pan/mold and she wanted to use that – so we cut the recipe in half. (I would do 2/3 next time – it wasn’t quite enough batter.) I was so worried by how thin the batter was, but it baked up so moist and beautiful. And she got distracted by the neighbor kids so we ended up filling and frosting the whole thing with the marshmallow frosting – no chocolate frosting. One question — I don’t know if we did something wrong, or if it was the cupcake mold, but we had to bake it for more than twice the time recommended. Any thoughts on that? But when it was done, it was AMAZING!!! Thanks for the great recipe! YUM! Hi, Michelle! I’m so happy to hear that you liked this cake. The bake time is for three fairly thin layers; your cupcake mold probably made a thicker cake which is why your bake time was quite a bit longer. Glad that it turned out for you – my kids love this cake too. Thanks for taking the time to stop by! I guess you can try that, but this makes a really soft cake, so you might have trouble slicing it cleanly. You can just use the two pans (and have a two layer cake), but I would not recommend using all the batter, it could overflow. Maybe fill each cake pan half-full with batter, and increase the bake time by a couple minutes. If desired, you can make a couple cupcakes with the remaining batter.